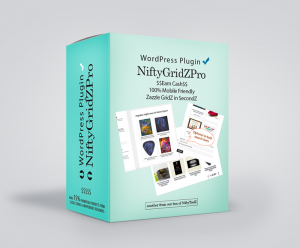 Get your premium NiftyGridZPro plugin license here and find out how to install and use it to showcase and earn from Zazzle products. With this licensed version, all links use your referral (associate) id, so you get any arising referral commission. And, what’s really cool – any posts / pages you’ve already made with the free version of NiftyGridZPro will all use your referral id instead of ours, right away! When you click the button for the license you want, Paypal will handle the transaction and you’ll get a link to a download file emailed to you (the plugin zip file for you to install). If you are upgrading, remember to save your fallback folder before installing it. Large proportions of the plugin code are copyright Crocus Information Ltd and may not be copied without permission. A single license will cover all the sites you own, however each of your clients, if you have any, will need their own license if NiftyGrizPro is used on their site(s). Installation is straightforward and uses the same steps as for the free version. If you’ve already installed the free version, you’ll need to deactivate it first before installing your licensed version. You may have read about NiftyGridZPro’s fallback grids. The one in the file you specify (or the default if you don’t) is displayed when Zazzle’s RSS feed is down. Find out more about fallback files in the FAQ, here: How do I make fallback grid files and where do I put them?